This study furthers the theory of conceptual blending as a useful tool for revealing the structure and process of student reasoning in relation to the Sierpinski triangle (ST). We use conceptual blending to investigate students’ reasoning, revealing how students engage with the ST and coordinate their understandings of its area and perimeter. Our analysis of ten individual interviews with mathematics education masters’ student documents diverse ways in which students reason about this situation through the constituent processes of blending: composition, completion, and elaboration. This reveals that students who share basic understandings of the area and perimeter of the ST recruit idiosyncratic ideas to engage with and resolve the paradox of a figure with infinite perimeter and zero area. This research was supported by the Israel Science Foundation grant no. 438/15. Gerson, H. & Walter, J. (2008). How blending illuminates understandings of calculus. 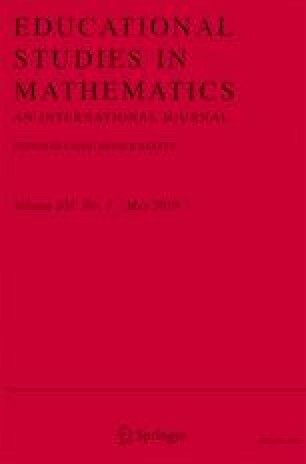 In Electronic Proceedings for the Eleventh Special Interest Group of the Mathematical Association of America on Research in Undergraduate Mathematics. Retrieved from http://rume.org/crume2008/Proceedings/Gerson%20LONG.pdf. Accessed 13 June 2017.